Teams from the U.S. Army have completed training for a new weapon system as part of the Atlantic Resolve effort that aims to rotate troops within the European theater to protect NATO allies within the region. The Army said Tuesday the teams underwent 40 hours of training on using the Javelin system through a computer-based basic skills trainer that allows for virtual practice sessions without the use of actual munitions. The trainer system also enabled soldiers to experience using the Javelin in simulated environments representing current locations in Europe. The sessions included misfire and malfunction scenarios to evaluate the soldiers’ capacities to react and address such problems. 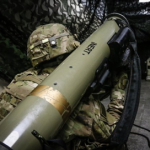 Jointly developed by Lockheed Martin and Raytheon, the Javelin was designed as a shoulder-fired anti-armor weapon built with a self-guiding tracking system and the capacity to fire at ranges covering thousands of meters. The weapon was made to be used against armored vehicles, tanks, caves and bunkers.